If you head for Bobby Jasoos for some hearty laughs and nail-biting thrills, you might end up sorely disappointed. But if you go with zilch expectations, you might find some rich cultural subtexts, the sort always hyper-exaggerated in Bollywood. And you might also relate to Vidya Balan’s Bilkis Ahmed, the slightly rebellious neighbourhood girl, than to Bobby Jasoos, the high-flying detective she aspires to be. Here is a film that is let down by its marketing hype and gimmicks. 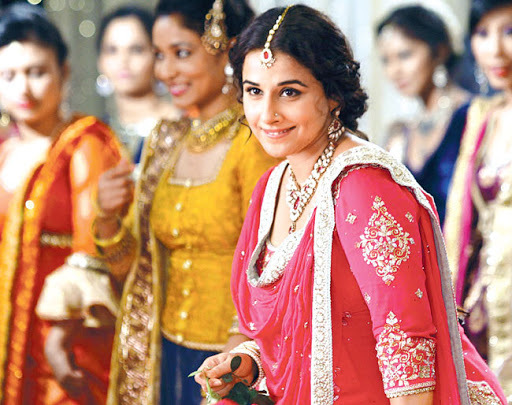 Vidya Balan’s fancy dress parade is not the strength of Bobby Jasoos. The film’s true weight is the manner in which director Samar Shaikh has picturised Hyderabad, and the household chemistry of a traditional Muslim family where the daughter is up to something that goes against all familial and societal norms. The silent rebellion between a father and daughter, the adoration of the mother, the loving impatience of a sister, the unconditional bonds of friendship and how love blossoms amidst all this is rather realistically portrayed in Bobby Jasoos – without the Bollywood clichés and exaggerations. But all that is lost in the central narrative of the film, where Vidya Balan is entrusted the task of shouldering Bobby Jasoos, a streetsmart detective. And doesn’t she stumble! Tasked with a territory she is not fully comfortable with, she resorts to what most Bollywood heroines do – overact or make faces. She redeems herself only when the character’s emotional intensity comes to the surface. As she has proved in the past, she is terrific at that – reminding you that Vidya is indeed one of India’s finest actresses who can spellbind you in the right roles. In Bobby Jasoos, maybe she was looking for a comic relief in her own career defined by intense roles, but the manner in which she fails at taking you with her also means the chance for a sequel to the movie is highly diminished. That is sad because Bobby Jasoos could have been much, much more, the very least that it could have been Bollywood’s first woman detective franchise. After all, not often does Bollywood bring a female detective from the underbellies of our cities and slums. Bobby is just that. She is a rebel in arguably a wrong setting. But with cheerful ease and a don’t-care-attitude, she goes about finding missing girls, until it seems to go terribly wrong. Yet why does Bobby Jasoos, the detective fail? The simple reason is that whereas director Samar Sheikh showed restraint with the cultural moorings of the story, he goes all overboard when it comes to the detective narrative. The breakthroughs that lead Bobby are all too forced, artificial or outright nonsensical. With every adventure of hers, you wonder whether she really does know what she is doing. This nagging feeling, which distances you from Bobby, comes to haunt you again in the film’s rather lame climax. A surprise factor of the movie is Ali Fazal, the ‘give me some sunshine’ student of 3 Idiots. He matches Vidya on the emotional level, and even outshines her when it comes to playful charm. The film also has a credible supporting cast including Kiran Kumar, Arjan Bajwa and Supriya Pathak, among others. Bobby Jasoos is not a comedy nor a thriller. Tell that to yourself and watch the film for a social drama in a real setting. You might enjoy it.